Easy to use and energy efficient, this full size dishwasher comes with our AquaIntense® technology which takes care of those pots and pans that need extra scrubbing, doing the hard work for you. Quiet as a whisper, the low noise level of just 43dB is perfect for open plan homes. Great for when you have friends around and there's extra cutlery to wash, the additional cutlery tray gives you more flexibility. It can house longer items such as carving knives or spatulas or replace the lower cutlery basket, making extra space in the bottom for fitting larger items. For perfectly dry and shinier dishes, try our SteamGloss® function which uses more heat at the end of the programme to reduce the size of water droplets. Great for a larger family's everyday needs, the large 13 place setting capacity means you can wash all your dishes, even bigger items, in one go. 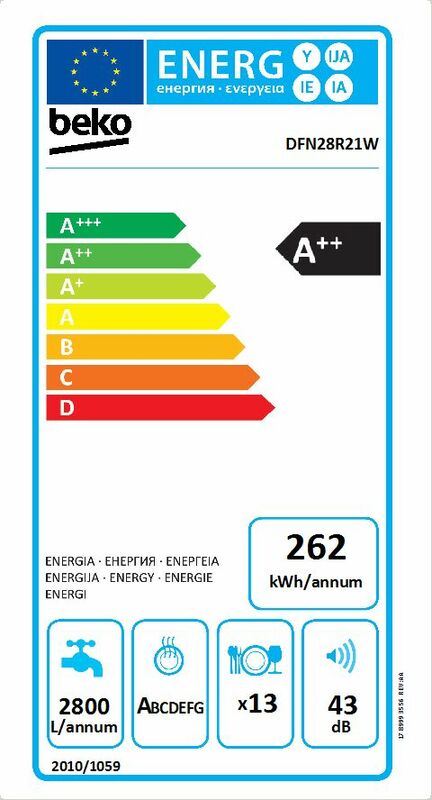 Saving you money on your utility bills, while guaranteeing an optimal wash every time, our clever Auto programme will always use the right amount of energy and water, based on how dirty your load is. The DFN28R21 comes with a 1 year guarantee as standard.